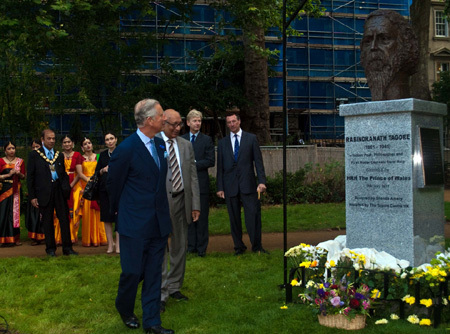 On 7 July 2011 in the heart of London, HRH The Prince of Wales unveiled a bust of India’s greatest artist Rabindranath Tagore in Gordon Square to celebrate the poet’s 150th Birth Anniversary. The Tagore Centre UK organised the campaign to install the bust and raised funds via an appeal. Kalyan Kundu, founder and chairperson of The Tagore Centre UK said he was unsure whether the Centre, struggling for funds, had a secure future, but the Tagore memorial – a symbol of peace – was being left behind as a legacy for future generations. The bust was sculpted by the artist Shenda Armery who has previously made ones of former Prime Minister Margaret Thatcher and former House of Commons Speaker Baroness Betty Boothroyd. The ceremony was simple but moving and was set amongst the greenery of Gordon Square. Even the downpour of the morning rain had stopped and the sun emerged as Prince Charles arrived and was greeted with applause from a large gathering of distinguished guests and friends. Prior to the unveiling there was a performance of Tagore songs by members of The Tagore Centre UK and four professional dancers who braved conditions to give a sterling performance for His Royal Highness. He also mentioned how Rabindranath Tagore not only made modern art in India, but also shaped the minds of modern India herself and was also a champion of the ‘one-world’ philosophy. 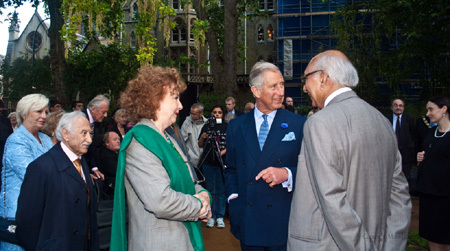 It was a theme that was also taken up by Prince Charles who gave an emotional and moving speech of his own adding that the occasion marked a message of ‘harmony’ from Tagore, and pointing out the site was a stones throw away from where one of the four atrocities of that tragic day had taken place. Prince Charles spoke about “the way climate is being disrupted and resources being dangerously depleted, and the skies, rivers and seas being polluted,” issues the Prince felt Tagore had anticipated. Prince Charles ended with a passionate appeal: “Perhaps more than anything else it is this message of Tagore we need to hear, tend to and with great urgency act upon. And with that His Royal Highness the Prince of Wales unveiled the Bust, which can be seen in the heart of Gordon Square near the University of London.